Cellular foam high performance short bumpstop for 2005-14 Mustang rear axle. Increases bump travel for lowered S197 Mustangs. MM's cellular foam bumpstops feature a rapid increase in rate as the suspension bottoms out, cushioning the impact at the end of bump travel before damaging metal-on-metal contact can happen. The short height increases suspension travel, which is very beneficial on lowered Mustangs. This MM bumpstop is 3/4" shorter than the stock bumpstop. The combination of short height and progressive cushioning improves both ride quality and handling ability. Why is handling improved when bump travel is increased? Lowering a car reduces the available travel when the suspension compresses. If the suspension bottoms hard onto a bumpstop, the effect is the same as if the spring rate skyrocketed. That causes a loss of grip at whichever corner of the car bottomed out. Increasing bump travel lessens the likelihood of the suspension bottoming out. That improves handling, and obviously also improves ride quality. The design of the cellular foam bumpstop provides a progressive cushioning effect. That progressive increase of the bumpstops spring rate eases the jarring effect of bottoming out. 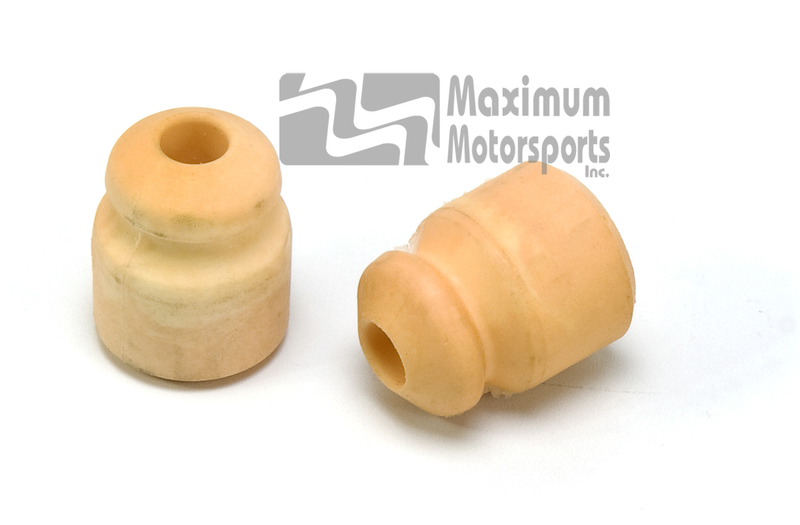 You can read Maximum Motorsports' highly detailed Mm5BSR-2 installation instructions before purchase.